A Belfast man has been tasked with reviving one of the world’s oldest religious orders in the city – an order whose paramedical wing played a significant role in administering first aid during the Troubles. The Order of Malta is an ancient Catholic lay religious order, formed in Jerusalem in 1048 with two main missions: the first to nurture, witness and protect the Catholic faith; the second to serve the poor and the sick. 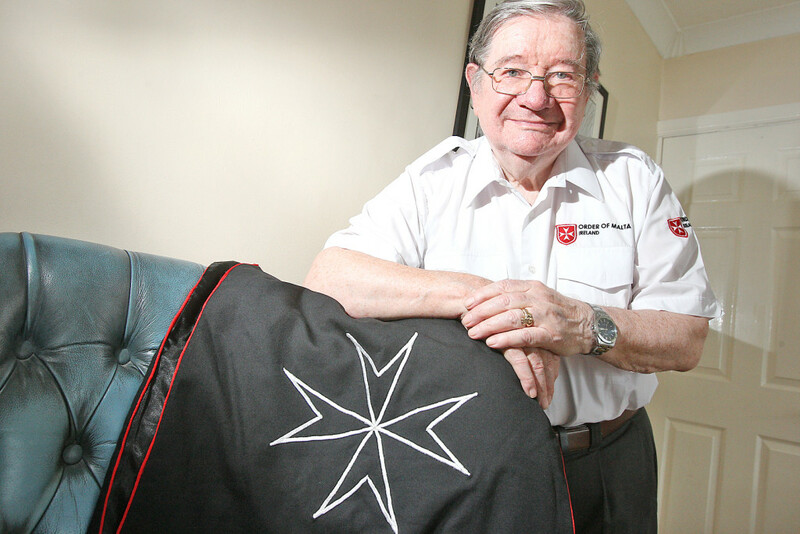 The Order’s Ambulance Corps played a significant role in helping the injured during the Troubles and the distinctive Maltese Cross was a familiar sight on ambulances at the scene of many infamous atrocities. But in latter years membership has fallen off and the Order’s ambulance work has all but ceased. However, local member James Allison – who is known along with other members as a Knight of Malta – has taken on the job of reviving their work in the Belfast. The 79-year-old Stewartstown Avenue man, who manned the ambulances right through the darkest years of the conflict, explained the history of the Order. For centuries, Knights of Malta were required to take a vow of poverty, chastity and obedience and were drawn from the highest echelons of the European military nobility. Today, only obedience is required and the Knights are drawn from all ranks of society. The Order’s Ambulance Corps – effectively the public face of the organisation – is a voluntary paramedic and first aid group. James became a member of the Ambulance Corps soon after it came to Belfast. “I liked the fact you got a uniform and the girls liked you in uniform,” he laughed. “I joined because I got a call from my mother who had been contacted by the head of the Legion of Mary at St Peter’s who said they had a welfare relief centre set up and wanted to know would I join. The Ambulance Corps’ main role in the city as an emergency presence at sport, leisure and public events changed dramatically when the Troubles erupted. “We did our normal work right up until 1969 when all hell broke loose. We did the work of a military medical centre almost. Our centre was on Sultan Street [off the lower Falls] and had people manning it all the time. I was one of the people in St Matthew’s church during the siege of St Matthew’s, helping the injured. With the arrival of the peace process and the accompanying fall in violence. membership of the Order of Malta Ambulance Corps slowly began to dwindle, and as the years passed and peace took hold the Corps became a much less visible presence. But James is now determined to recruit new members and revive the Order of Malta with a new mission and renewed enthusiasm in a much-changed environment. “We are having an open event in the Mater Hospital where anyone interested is invited to attend. People can come forward and be trained as first aiders. James said that although their numbers dwindled and activity dropped off, the Order has always maintained a presence and it is that existing framework on which it hopes to build and grow. “There are ten units of the Ambulance Corps in the north and across the island we are the biggest providers of first aid. The Order of Malta Ambulance Corps event will take place in Saturday, June 20 at 10am in the board room of the Mater Hospital. If you’d like to know more about the organization, call James on 028 9061 5118.